I’ve got two items that I’m very very excited to review today, so lets get into it. Product Description: Bourjois has created the new powder sensation SILK EDITION. The compact powder that takes you on an extreme sensory experience. Inspired by silk, the texture of Silk Edition is designed to glide over the skin as lightly as a caress. Its formula is melting and it has an undetectable finish. Silk Edition evens out blemishes and dark spots. The crystalline powders contained in the formula provide a matte complexion for 8 hours while preserving the brightness of the skin and without drying it. The complexion is matte but never dull! Equipped with a 360° rotating mirror and a soft sponge, which reinforces the smoothing effect, this slimline compact is incredibly practical. Designed as an accessory to be carried at all times! Opening up the product, we can see that the product comes with a thin sponge, designed to apply the product smoothly and evenly. Usually the sponges that come with compact powders are utter rubbish, but this one, I really like. And the best part? The 360° swivel mirror. Definitely something new that I’ve not seen before. Personal Thoughts: To me, this seems more like a powder foundation than a compact powder. The application is quite creamy, yet feels velvety matte too (sans drying I tell you!). Since it acts as a powder foundation, you don’t have to apply any kind of foundation before hand. The product definitely packs on very densely, so do make sure you don’t put on too much or you may look slightly cakey. Living up to its name, the powder glides on to skin just like silk, and leaves my skin feeling as if there’s nothing on. It covers up most of my dark spots, though I still need concealer for certain stubborn areas. Though it is claimed to last 8 hours, I found that it started fading on me on the 5-6 hour mark. Packaging wise, I love the sleek and slim design of the compact. It fits into a clutch or purse for a quick touch up, anytime. Ingredients: Talc, Zea Mays (Corn) Starch, Octyldodecyl Stearoyl Stearate, Dimethicone, Oryza Sativa (Rice) Starch, Boron Nitride, Calcium Carbonate, Silica, Zinc Stearate, Pentaerythrityl Tetraisostearate, Caprylyl Glycol, Ethylhexylglycerin, Dimethiconol, Tocopheryl Acetate, Parfum (Fragrance), Zea Mays (Corn) Oil, Orchis Mascula Flower Extract, Panthenol, Hydroxycitronellal, Cinnamyl Alcohol, Eugenol, Benzyl Salicylate [+/- (May Contain): Mica, Ci 77007 (Ultramarines), Ci 77491, Ci 77492, Ci 77499 (Iron Oxides), Ci 77891 (Titanium Dioxide)]. Swatch of the powder. As you can see, it applies quite smoothly, and I assure you, once its blended out, looks absolutely natural. Applied the powder on the right side of my face. (or in the pic you see, on the left lol) As you can see, the side with the powder is much smoother and silkier. The compact powder retails at RM53.90, but is on sale for an introductory price at RM49.80 from 27/1 to 4/3. PS: Lipstick on me is the Too Faced Melted Liquefied Lipstick in Ruby. 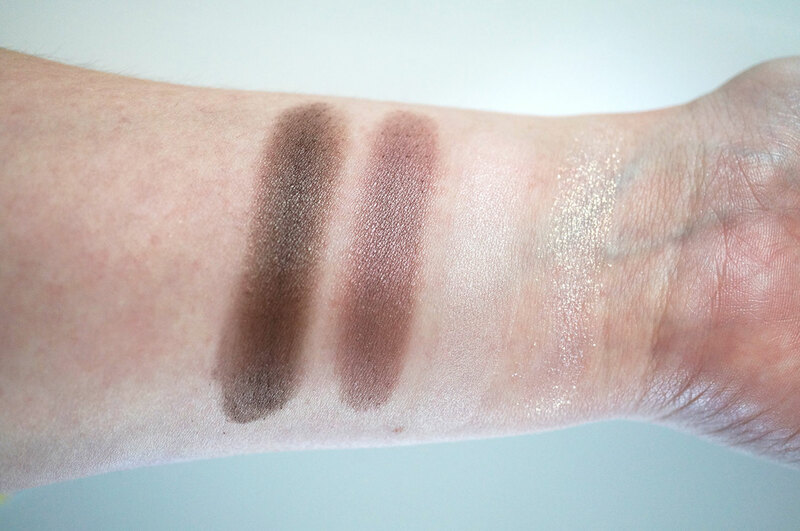 The second item we have is the Smoky Stories Eyeshadow Quad in the shade 02 Over Rose. Product Description: Create your smoky eye look, from subtle to intense. Prime, shadow, define and highlight the eyes with Bourjois’ Quad Smoky Stories eyeshadow. Each palette has 4 complimentary shades that blend effortlessly together to create the perfect smoky eye. And what’s more, the lightest shade has an integrated base primer to prolong colour for 12hr hold. Available in 8 lovely shades. I have Over Rose to review, and swatches are as per below. For more detailed swatches, do click here. Personal Thoughts: I like the pigmentation in this palette, and they apply very smoothly. Though there is some fallout experience, but I wonder id that could be because I tried them on without an eye primer? The middle shade, (labelled as no.4 in pics) has the most fallout, and is probably my least favourite shade since it is just wayyy to shimmery. The shadow palette retails at RM46.90, but is on sale for an introductory price at RM42.80 from 27/1 to 4/3.